The A20 Olinuxino LIME is a low-cost OSHW board that fits in the palm of your hand. This board is produced by Olimex and can be purchased for about 33€. A20-OLinuXino-LIME looks identical to Olimex A10-OLinuXino-Lime, except for the more powerful A20 processor. There is a second version of the A20 Lime (with 1GiB of RAM and Gigabit ethernet), called the Olimex A20-OLinuXino-Lime2. The board handily reads "A20-OLinuXino-Lime" on the back. Official images can be found here. 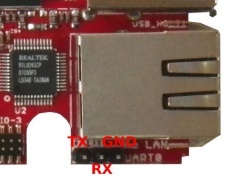 For building u-boot, use the A20-OLinuXino-Lime target. Use the A20-OLinuXino-Lime_defconfig build target. Use the sun7i-a20-olinuxino-lime.dts device-tree file for the mainline kernel. The recovery button (right, under the battery connector) triggers FEL mode. 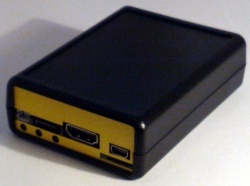 You can attach several Olimex LCD modules to the LCD connector (LCD_CON). You will need a 1.27mm pitch to 2.54mm 40 pin cable though. There is a clearly marked 3 pin 2.54mm header which exposes UART0, just attach some leads according to our UART howto. This type of device has no rebadges. Olimex wiki page with detailed board information. This page was last modified on 18 January 2018, at 17:13.